Abstract: CES 2016 has begun and there are numerous products full of novelty and creation showing the latest achievements of science and technology. For example, Samsung lets you look inside its fridge without opening the door, SONY Xperia A new model, Panasonic new digital camera Lumix DMC-TZ100 and so on. Airwheel will also take this golden opportunity to show its new models, and mini saddle-equipped electric scooter S6 stands out. For example, Samsung lets you look inside its fridge without opening the door, SONY Xperia A new model, Panasonic new digital camera Lumix DMC-TZ100 and so on. In CES, it is never short of self-balancing electric scooters. However, the appearance of Airwheel S6 still makes the visitors astonished, as the S6 sitting posture self-balancing scooter has subverted the general riding mode by adopting two sensing systems to realize a variety of riding ways with more humanized design and graceful posture. S6 is suitable for a wider range of occasions with the most elegant pose. Elegance is an attitude and S6 will help you to make such elegance come true. In order to keep up with times, Airwheel S6 intelligent electric walkcar can be connected to the riders' phones by downloading the custom-built App for Airwheel self-balancing electric scooters. The central control chip equipped in the inside will collect data and wirelessly transmit it to your phone. Through instant analysis and arithmetic, it can get visual data, which can feedback to the user by App in real time, such as Data statistics, travel path, Vehicle positioning and burglar alarm and so on. Intelligent system makes Airwheel S6 is closer with you. Even though there are countless advanced technological products in CES, the Airwheel intelligent electric scooter can not miss. Now, find Airwheel at booth No. 48001 & 48003. 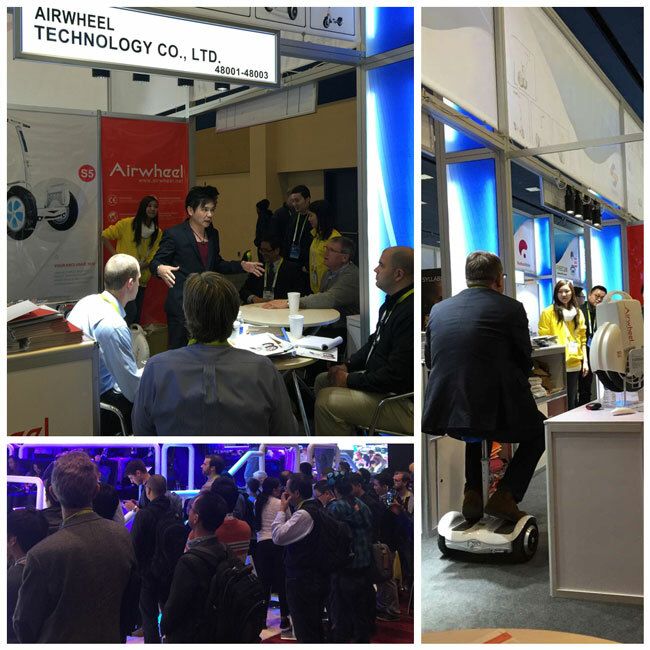 Previous：Airwheel intelligent two wheel self balancing unicycle are well received in the 2016 CES.